March: Portland friend Mulvey took us to the airport and ran a last errand for us. April: Portland bodyworkers Todd and Bob each carefully answered my email requests for specific advice about my dislocated shoulder. May: Portland friend Denice shared her vacation with us in Malta and brought us some items. June: A non-English-speaking French dentist accepted me as a walk-in patient and replaced a failed molar crown. A first: an offer to shelter from the rain in someone's car. July: An East German couple invited us to shelter from a downpour in their car. August: A German-speaking couple embraced and amplified the fun of our first barefoot hike by joining in. September: Bill's thumbs finally rested after delivering nightly 'sleep aid' shoulder massages for over 3 months. October: A Spanish hostess gave us the only room in the hotel with a terrace. November: The Spanish truckers were so careful with us in the gusty winds. Of course, we received many more kindnesses along the way from strangers and from friends and family at home. There are the ones we know about and it's always fun to wonder just how many lucky happenstances are really the product of other peoples' kind intentions. Our camera that was purchased in mid-2008 and repaired over the winter never performed well. Our previous 2 digital cameras took great photos and this, #3, was terrible. Bill believes that it is a light meter problem that the factory servicing couldn't get right. With our other cameras, almost every shot was good enough to be a "keeper" and choosing the best shot was often a matter of picking one from the many. In contrast, with our new camera, I often wouldn't have a single good shot when I went out specifically to capture a scene. A classic: overexposed sky, everything else underexposed. 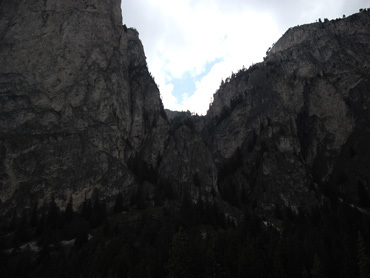 For my piece on Vallunga in the Dolomites I took over 100 shots one morning in hopes of getting 4 or 5 usable photos. We were both dissatisfied with my results so Bill headed out to Vallunga expecting to do better with his 50 photos in which he "tried all kinds of settings" instead of using it as a 'point & shoot' as I did. But his product was the same--terrible! With severe cropping and extensive touching-up, we managed to meet my goal of a few Vallunga shots, but not a single photo was a quality shot. Becoming consumers of electronic instead of hardcopy Lonely Planet guidebooks while overseas was a resounding success in 2009. For ease of use we'd still wildly prefer to have the hardcopy but there is no going back now. By buying electronically, Bill pays in those limp, weak, US greenbacks rather than those glitzy Euro's, saving us 40% or more right there. In the past, we'd have to make a trip to a capital city to be reasonably assured of getting our hands on an English version of the guide book for the country we were in or the next country over. Now all we need is a good internet connection--which takes some planning--but not days out of our itinerary. And not burdening our overloaded bikes with the bulk and weight of the 2 or 3 books we'd often carry at a time is a huge relief, especially when we are cresting multiple mountain passes in a week. Trip planning is definitely more cumbersome with the electronic versions and tracking down a tidbit we have read in it is a nightmare. Some of the sentences get chopped and blended when uploaded on to our PDAs, making that a useless exercise. An 'intermediate solution' or compromise in using the electronic versions is created by loading a city's walking tour onto a thumb drive and then printing it at an internet shop so as to get the hardcopy benefit of those often well-crafted tours. At the end of this year I caved-in and decided to buy a hardcopy guide book for Morocco when back in the States. Intensely using the electronic book for detailed trip planning rather than as an occasional reference was too, too frustrating. The electronic guide allowed me to get a jump start on planning, but it didn't stand alone. This was Year 2 of Bill's relationship with a Garmin GPS and they have bonded. The learning curve is steep and the expense is high (buying all of those additional maps) and yet it literally opens up opportunities to us. Back roads that we had to bypass in the past because the paper map wasn't complete enough to be reassuring are now roads we can take with confidence. 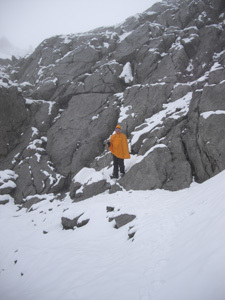 Bill originally bought the system for hiking safety and it has served us well there too. Unfortunately using GPS hasn't eliminated the need for buying maps altogether, but it's reduced the volume. Paper maps are still necessary for planning and for back-up in case of a failure or discrepancy. And our heavy reliance on GPS helped push us into buying a second, back-up laptop for 2009 as Garmin is useless without ready access to a computer--something we experienced in 2008. Buying our heavy-duty, German-made touring tires in Europe has been a surprising bug-a-boo and we usually must travel to Germany or a larger city in Austria to get what we want. That of course, isn't always convenient. Bill's recurrent shopper-frustration led him to discover that Amazon.com is alive and well in Europe. He was able to online order precisely the tires he wanted from Amazon.de (Germany) and have them delivered to our apartment door in itty-bitty Obergurgl, Austria. We will likely mail order our tires from Amazon.de annually. If you are in the States and are buying a gift for someone in Europe, seriously consider buying it from Amazon to save on the hefty international shipping fees and avoid potential customs issues. Of course, you'll need to factor the value of the dollar into the equation, but hopefully that issue will shrink in time. France, Germany, and the UK seem to currently be their most advantageous sites, or perhaps their only sites in Europe, and sometimes free shipping is available from them. Check it out and do the math before you send another package overseas from the US. Electronics, especially the laptop, are usually the main source of disruptions to the tranquility of our traveling life, but not this year--this year it was me--except for the laptop battery going belly-up in September. Most years Bill spends dozens if not hundreds of hours while on the road dealing with glitches created by a new laptop, a new operating system, new software, new interfacing components, or frank failure of the computer as has happened twice in 8 years of carrying one. But not this year. This year the main time-sucker in the electronics category was trying to make the camera perform passably, and it took a fraction of the time that other electronics challenges had taken in the past as there was only so much that could be done. Rather than electronics' hassles, in mid-April it was the full or partial dislocation of my left shoulder that threw a monkey-wrench into the works that would haunt us for months. First, it was the 10 day layover in Montenegro that was required before I could manage the stresses of navigating a loaded bike and could be at least a little bit jerk-tolerant. That layover put in a crimp in the calendar and necessitated taking the train in May to make a previously scheduled flight to Malta. Even 3 months after the injury, Bill's route planning was still being amended to create shorter riding days and more layover days because of "the shoulder." Fortunately rehab'ing the shoulder didn't take big chunks out of our days. Most of my rehab was carefully executed "in the field". Steering my bike was all of the strength work my shoulder could tolerate most days for the first 2-3 months though carrying my panniers into our room at night and hauling groceries gave me additional isometric strength training. Daily icing of the injury for almost 3 months did intrude on my evenings a bit, though the 20 minute sessions weren't entirely given over to icing. Pink "Palla" riding in the bag on Bill's bike. Flexibility work was usually time-sliced with brushing my teeth or waiting in a grocery store line. I did give-up other activities to go swimming a half-dozen times to challenge the range-of-motion restrictions and occasional diversions like ping-pong and bouncing a ball didn't take a lot of time. It wasn't until about 14 weeks after the injury that "the shoulder" moved into the background of route planning and our day-to-day routines. Bill kindly added bulk though not too much weight to his load for months by carrying a beach ball he bought for my rehab work. He'd read about ball bouncing as literally being good shock therapy for dislocated shoulders and I eventually also used it in my flexibility work for the joint. "Palla" is one of the Italian words for a ball and she quickly became a member of our family of travel objects with names and personalities. Then it was me again making a mess of the route in mid-June as at bedtime one night part of a molar snapped off with an inlay attached to it. Thank goodness there was no pain but we were on a remote mountain top in the French Maritime Alps on Day 3 of a 7-week itinerary. The whole itinerary had to be abandoned while we scrambled to get a new inlay made. After Bill recovered from the shock, he was able to craft a seamless new route that included a 2 week loop back to Menton, France where the inlay was formed and installed. In July I had the unhappy experience of having what we think was a fire ant crawl up my pants and attach itself to my thigh. I didn't know what was happening, but when slapping through my clothing didn't resolve the pain, it took little consideration before I was dropping my pants on the edge of the hiking trail and calling for Bill to come quickly. It was early September when the implausible happened: a yellow jacket had apparently landed on my sandwich and escaped my notice until it stung the inside of my cheek and tongue tip. I thought I'd been speared by a grain hull from my multigrain roll but when I spat the offending object into my hand it was clearly a bee-like thing. Despite immediately popping an antihistamine, in little time my cheek became huge and red. We were on our way to an Innsbruck museum but delayed our visit until we were confident that the swelling wouldn't obstruct my breathing. Fortunately that wasn't a problem but I'm sure Bill wished I had a sign around my neck that said "He didn't hit me." I felt generally, though mildly, ill for the rest of the day but unexpectedly the swelling had begun its retreat by bedtime. The first surge of the novel H1N1 virus came as we were poised to fly to Malta in May and we considered abandoning that trip as well as our cycling season and returning home. Luckily it didn't take long for it to become clear that the bug wasn't as ferocious as the 1918-19 pandemic virus, as was first thought, and we decided to 'stay the course.' We did however continue to monitor the news about the virus and the vaccine development very closely and made a point to stay out of the cities and be more pristine about not touching our faces with our hands. In late August I had a scare as I awoke shortly after midnight with a raging sore throat. We were in the tiny village of Obergurgl, Austria and the next morning we began inquiring as to how I could access Tamiflu should my illness progress rapidly over the approaching weekend. We bought a thermometer so as to know if I qualified for the prescription with the necessary 104° temperature. Fortunately it was a false alarm and the illness didn't progress beyond a brief sore throat. It was hard not to notice that I was on center stage for all of these unhappy episodes and Bill was sliding through the year with a lot less pain and demanding a lot less attention and route diversion. He did bang up several toes inside his hiking shoes in July and eventually lost a toe nail in September. And he was relieved to get a professional opinion in Austria about his dental discomfort: only sensitivity, not a cavity. The 2 x-rays and unscheduled visit with the dentist set us back less than 2 hours and less than $100--a bargain for the peace of mind. Two years prior Bill tried hard to create a Dolomites-like hiking experience for us in Austria, as in making a string of wonderful day hikes from a pleasant tourist apartment. 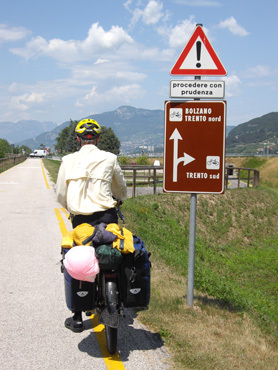 In 2007 we biked to several venues he had identified but there was really only a single good hike available from each without a car. One of our Austrian hiking venues served by a lift. Improvements in Austrian ski-town websites over the last 2 years combined with his previous strategy of scrutinizing the maps for notations that given ski lifts operated in the summer delivered results in 2009. Our extended stays for hiking at both Obergurgl and St. Anton were products of this year's enhanced research. In 2006 Bill bought proper boots to launch his Via Ferrata hiking career in the Italian Alps and in 2008 he abandoned them for "light trekking shoes" which were more like hearty running shoes. His first pair, "Timberlands" purchased in the Spanish Pyrenees, where a huge success. He loved the greater foot and ankle flexibility compared to his boots but felt more secure than when wearing sandals, which is what I wear when hiking. One more white knob fell-off with each hike. His "Timberlands" lasted about 9 months and he replaced them with a pair of "Dolomite's" he bought in Italy. 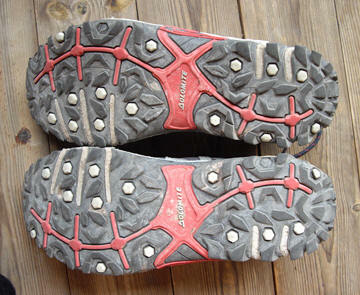 After 3 weeks of hard hiking in the Dolomite peaks, his "Dolomite" brand shoes were shot. After each hike he'd laugh as he took inventory on his soles. The traction knobbies were falling off at an alarming rate and the softer parts of the tread in general were shredding visibly. In short order his "Dolomite's" had delivered 1 blister, 1 very sore toe, and forced him to baby-along a purple toe nail that was destined to fall off. However online searching yielded new lacing techniques that allowed him to keep wearing the shoes without damaging any more toes. After 6 weeks of ownership which included the 3 weeks of hiking, the deteriorating "Dolomite's" were tossed and replaced with a pair of "Salomon's". It was about the end of hiking season but a couple of robust routes were completed with no visible damage to his toes or his "Salomon" soles. It looks like he'll have to buy a new pair of light trekking shoes for each season and it will only be known in hindsight whether his latest selection was a winner or not. Like so many products, the models change each year and the models he buys in Europe aren't available in the US, making each year's purchase a new adventure in itself. Hiking barefoot in seriously rocky terrain. 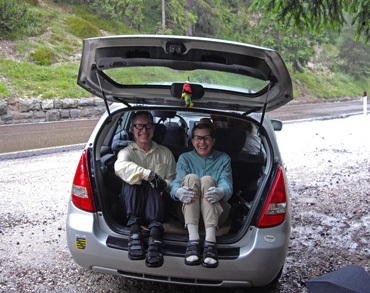 Quite unexpectedly, a month later in Obergurgl, Austria we were experimenting with hiking without any shoes at all. The high elevation, sod trails seduced us into taking off our footwear and walking barefoot. It was a bit shocky at first, but we both loved the sensations and playfulness of it. 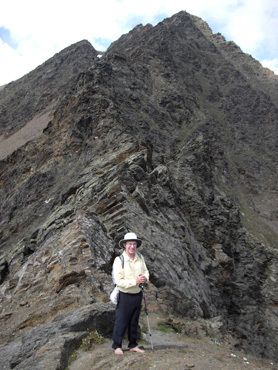 The next of several hikes included increasingly long segments of unshod walking. We're now excited about trying Vibram's 5 Fingers as an intermediate solution to hiking footwear--almost the freedom of being barefoot without the need for so much caution. Another learning curve that Bill played along late in 2009 was discovering that maybe he wasn't as thoroughly right-handed as he thought. Out of the blue his left hand asserted itself and we both watched as it experimented with being more dominant. Being the active instead of the supporting hand in peeling oranges was one of 'Left's' first successes. Emboldened by that success, Bill explored letting his left hand be in charge of navigating sandwiches to his mouth, wielding a fork, and brushing his teeth. He discovered that Left especially liked selecting individual pieces of fruit at the market. It was a fun bit of play for which our less-structured lifestyle could easily make room. Finally off of the "Must See" List: Musee de Prehistoire in Les Eyzies de Tayac, France. 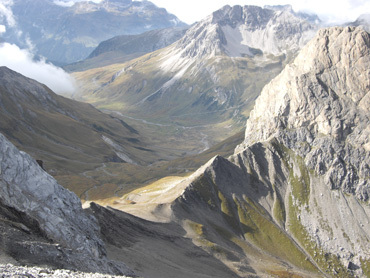 Never need to do again: Being scared to death on "Flight 644," a St Anton, Austria hiking trail. 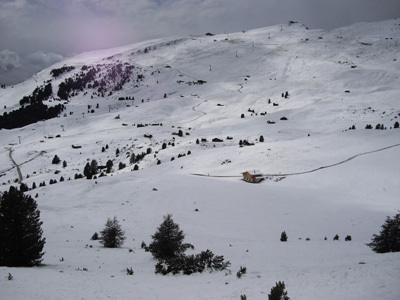 A significant snowfall in Selva di Val Gardena on July 18. Austria: snow again in mid-September. What are those strange Montenegrin huts? Ancient ruins of ...Club Med. Our eyes were wide open as we explored more of Montenegro this year and when we cruised by a wetland's reserve on a day ride, we were sure we'd spotted something unique to the region. The ruins across the waterway piqued our interest and we peered from afar and looked for descriptive signs trying to learn what our trophy find actually was. We took multiple photos from the scarce vantage points to document our discovery. It was prowling through the electronic Lonely Planet guide book that answered our question and made us feel the fools: it was an abandoned Club Med location. That's it for 2009. We had a memorable year and hope you enjoyed sharing in it. Our next piece will be available online in March, perhaps April of 2010. We'll start with a non-biking visit to Morocco and then Portugal will be our first biking destination.